Last month, we welcomed 47 new students (43 freshmen, 3 sophomores, and a junior) to TVHS for the first time and reunited with returning students. In all, we have 130 students from 31 districts and 7 counties. During the first days at school, we worked on building our community through a variety of activities. It’s always exciting to find out what the personality of a school is going to be after seniors and exit and new students enter. A culture is not a static thing–it is constantly evolving. Change can sometimes be difficult, but it is a reminder that the culture of a community is a living thing. Like all living things, it requires constant tending and care to make sure it grows in a positive direction. 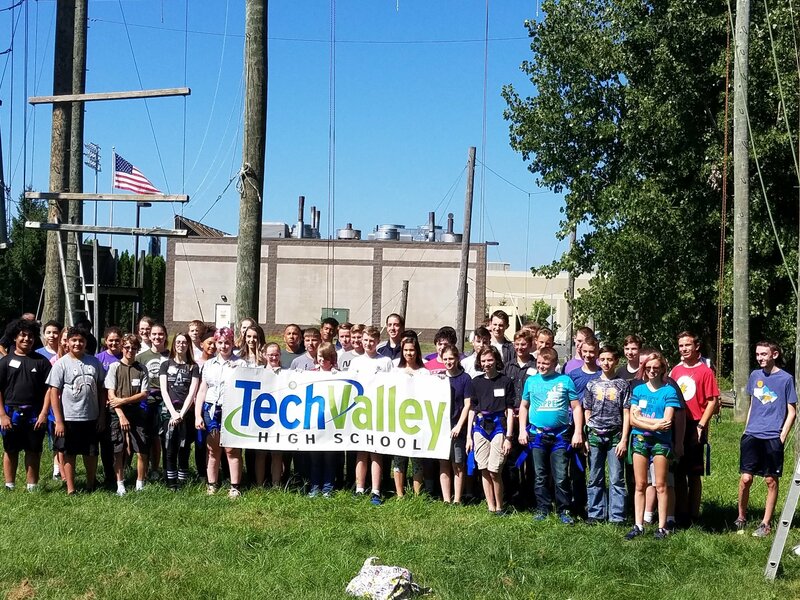 New TVHS students completed the ropes course at Hudson Valley Community College in Troy to begin the school year. During September, TVHS students went to a ropes course, the NYS Court of Appeals, University at Albany, Albany Pine Bush Six Mile Waterworks, the Iroquois Indian Museum, and toured the SUNY Poly nano fabs. We built a new roster of clubs, opened our new fitness room, and began brand new classes in Creative Writing and Art and Nanotechnology and English. Students have completed projects in most classes and have likely already presented several times. We’ve also welcomed our first handful of educators from different locations to learn from our students and teachers. On top of all that, we’ve had an Open House and a Spirit Week. Despite some bumps in the road, it has been a lot of fun and I’m happy to report that we’re continuing to grow in a positive direction. As always, thank you for your continued support of Tech Valley High School!